Awesome! Great graphic with the tutorial – I pinned it! Thanks so much for posting this! I am due in 2 months and am already dreading the wardrobe change that will need to occur! This looks so simple though, and it will be a huge lifesaver! How does the tank stay up in the back? Do you have to constantly readjust it? I buy them fitted, so it doesn’t sag in the back. They go under clothing, so I don’t want them to be too loose anyways. This is a great idea! I like clip-on nursing tanks but not spending $25 on them. Thanks for the idea! What do you do with the strap in the back to keep it from coming down? I find that if they are fitted enough, they don’t fall in the back. I have a couple that are loose, that slip a little, but it’s usually not much if an issue. I and my sister-in-law have both just recently started breastfeeding and have been lamenting about the lack of clothing choices for us, especially because we are both smaller women. I bought some nursing tanks at Target yesterday, without trying them on since I had the baby, and come to find out, they are huge on me and won’t work. You may have just provided the perfect solution to my problem. So glad I found this on Pinterest. Thanks! Yea, most nursing items are maternity as well, which really throws the sizing off! Awesome idea! I will be doing this! Could you do the same alteration for the back of the singlet and slip the loop over your bra strap to keep it up? 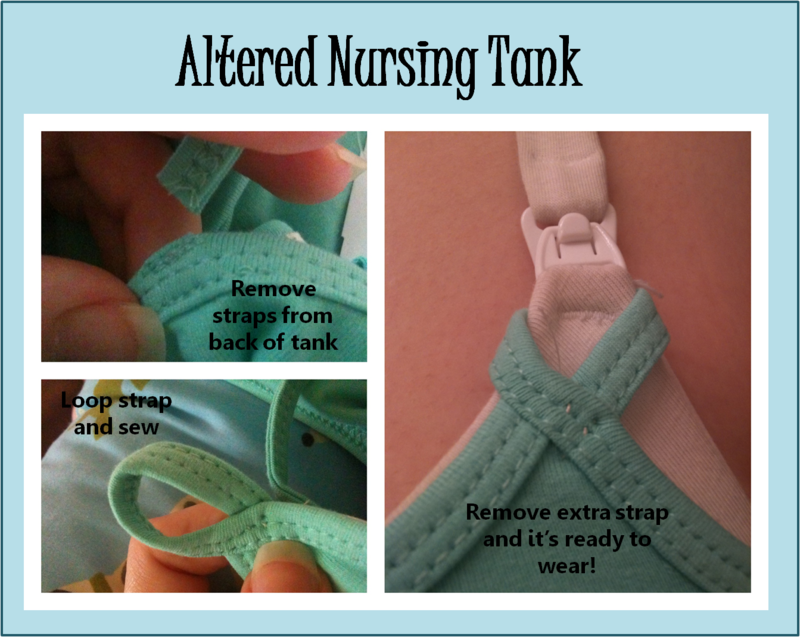 I don’t think that would work since there would be no way to get the loop onto the bra strap? I find that if they are fitted enough, they don’t fall in the back. Could put a snap onto on the back where the loop ends come together. This is awesome! What a simply brilliant idea! for everyone who has questions about the back its just like wearing a tube top shirt you dont need straps to hold it up. thats why you have to get a fitted shirt so it isnt so lose to fall. Love this and working on some right now since my first little one is due in just a couple weeks! You are a genius! Thank you, thank you, thank you!